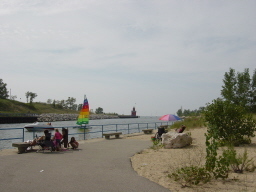 Holland State Park and Ottawa Beach are one of the most popular state park – beach combinations in all of Michigan. This beach offers a very wide expanse of beach with great views of the lighthouse and sailboats. The picture above, which was taken right at the entrance to the beach (state park) shows both of these. This is an excellent place for our family, not just because it has the essentials of great swimming, sand, views and sunsets, but also because of the great things to do right next to the beach. 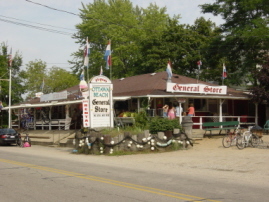 Right outside the entrance to the beach is a must stop in Holland . . .the general store. This is a general store / ice cream store that puts you right back to being a kid (or if you are a kid it makes you glad to be one)! You have to stop and check it out if only because it is the local hang out for anyone that has a nearby Holland Rental. 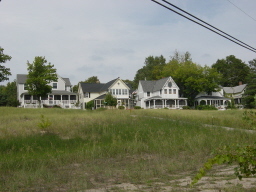 Speaking of here is a great picture of some of the rentals and homes that overlook the beach . . . So if you are visiting Holland, Michigan in one of our great rentals, make sure to visit Ottawa Beach, the beach and park are excellent, the nearby area is great fun, and the sunsets are perfect.